Sod is used in a variety of different landscaping projects, including professional sports stadiums and parks. Sodding is popular because it is a quick and easy way to get your lawn established. An average sized yard can be installed in a few hours, and will be ready for regular use in about three weeks. If you are considering sod for your lawn, be sure to contact a trusted lawn care service to help you through the process and handle the installation for you, as you don’t want to make a mistake on your lawn. 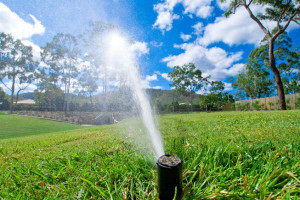 There are many other benefits to using sod as well, besides the quick installation. While you may not think the reduction of heat in your lawn area matters too much, there are many reasons it can be a benefit. A lawn can cool your entire property, reducing greenhouse gases and carbon dioxide. The air around your home will improve because of this, making it easier for you and your family to breathe. The air will be cooler as well, and a sod lawn never gets as hot as rock, concrete, or artificial turf. If air quality is a concern of yours, a sod lawn can be a fantastic investment. While you probably are not considering selling your home at this point, you may wish to sell it further on down the line. With a sod lawn, your home’s value will be more than it would be with other options. Potential buyers will be more attracted to a natural lawn than they would a concrete surface or even artificial turf. By improving your home while you live in it, you make a good investment for the future when you want to sell it for a positive gain. Sod, unlike other forms of seeding, can immediately control erosion on your property. Steep hills benefit a lot from sod, as it can immediately establish stabilization. Sod filters dirt and dust from your property and works to eliminate mud, all while keeping the air around your house clean and fresh. A sod lawn can even keep the noises coming from your home from carrying too far. If you wish to benefit not only the environment, but you and your family, installing a sod lawn is the way to go.